I'll admit that this book hit me pretty hard. I knew when I agreed to read it that it was going to be emotionally-charged, but knowing and feeling aren't the same thing. The opening chapters where the families of the four main characters, Pato (the narrator), Arbo, Marcos, and Gladys, are murdered packs a punch. I appreciated the fact that Pato doesn't behave like a brave hero, he behaves like most people would, he freezes up and soils himself. When Arbo is seen by the gunmen, crying over his father's body, Marcos steps in and shots Arbo's assailant. The problem is that that assailant's brother sees them do it and swears to get revenge. And while the teens manage to escape, they have very little going for them. They have no supplies and no family they dare approach for help. Seeking shelter at the house of an elderly acquaintance of Pato and Arbo, they have to decide what they are going to do, especially when they learn there is a price on their heads, a big one. Their options are few and they decide crossing the border into the United States is their only hope of survival. But things continue to go wrong and soon the four teenagers are left wondering if it's even worth the effort. Goodness it was hard reading about the loss these kids suffer and knowing that it isn't uncommon south of the border. Even harder is reading about their struggle to survive in the desert, a beautiful, but brutal place that they are utterly unprepared to face. When further tragedy strikes, I literally had tears running down my face. And yet I had to admire their persistence in the face of almost impossible odds. Frankly, a book like this is needed. With all the contention over immigration law and building walls, it's easy to forget that their are real people involved, many who are truly desperate to make a better life for themselves. 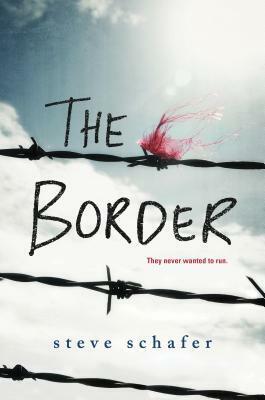 This book really made me think about those who are caught in the middle coming her illegally. I believe I now have more empathy for them. One note on content: there is some profanity, mild sexual activity and references, and quite a bit of violence, some of it down right heart-breaking. Please keep these things in mind when sharing this book. Not all teens will be able to read this.